CxO Meetup / G+ Group HIRL! Don't Miss It!!! A call to managing CxOs, business executives, decision makers and Social Media professionals everywhere! 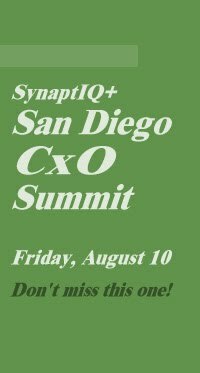 You are invited to convene in San Diego, California on August 10 for the first SynaptIQ+ San Diego CxO Summit to explore, discuss and reveal the current state of best practice and latest findings in online/offline Social Business principles, tactics and strategies. The takeaway... This full-discovery-day, event provides the Social Era intelligence, tools, strategies, know-how and skill-sets that lower costs, drive up value and increase profits. Don't Miss It!